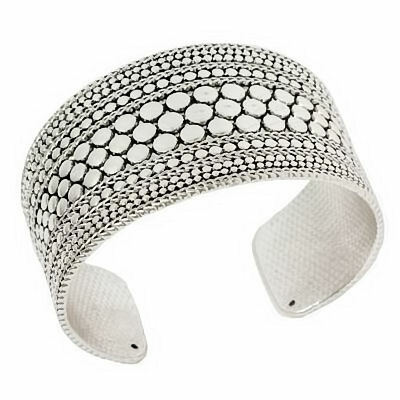 This designer silver cuff bracelet is made from lead free pewter with a shiny silver overlay. This cuff bracelet is 1 5/8" wide at the front and tapers to 1" wide at the back. Measuring from side to side on the longest side, it measures 2 3/4 inches. This bracelet can be adjusted by squeezing the sides SLOWLY in or out. One size fits all. This is a very classy looking bracelet!